A Medium Size, Visibly Aged And Anciently Asymmetrically Use Sharpened, Well Made, Red River ( Cody ) Knife That Exhibits Stone Sheen Coloration And Surface Aging Patination, Correct Rolled Basal Stem Edge Hafting Dulling, Correct Blade Sharpening Use Reduction, Polished Blade Use Wear, Correct Early Style Blade Flaking, Rolled Blade Hinge Use Wear, Correct Material And Manufacture For The Area Found. 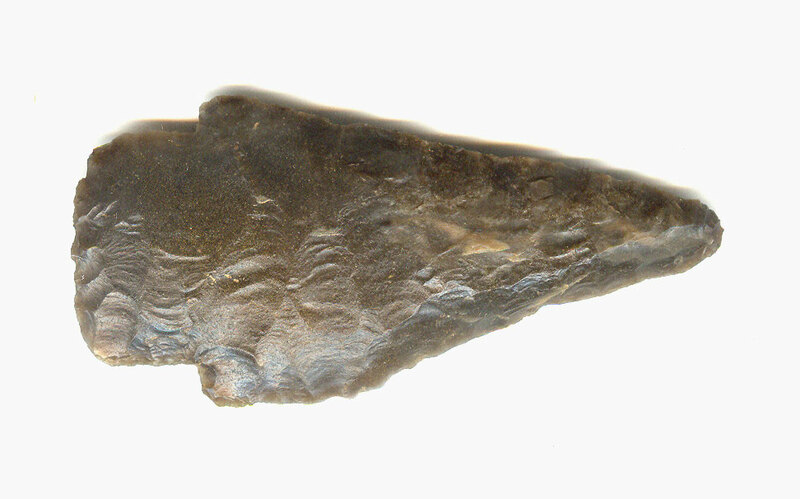 The Red River Knives Were Made By The Cody Complex People, Some Were Made From Scottsbluff Points, Such As This Example, While Others Possibly Were Made Specifically For A Use! Includes Tom Davis (3/2/1999) And Ken Partain Certificates Of Authenticity.